in each of the Northern sections and 10 in each of the Southern Sections. The total subsequently became 47 when three late entries were accepted. (Anglian, Brighton and Northampton) were subsequently added after the draw was published. Subsquently (5th March 2013) the acceptance of three late entries was announced from the five non entries above. The Anglian Combination, Brighton, Hove & District League and Northampton Town League were all added to the draw. This would consequently mean re-arranging the geographical allocations of the byes initially announced. The Northampton Town League would host the Anglian Combination with the Brighton, Hove & District League receiving a bye. a Preliminary Round of just two ties in order to reduce the numbers to 32 to fit with the original plan. with the two previous finalists (Jersey and Isle of Man) exempt to the First Round. If the completion date is at the end of April, why is the Northamptonshire Combination home game being played on May 4th? F.A. guideline completion dates are negotiable, same with other F.A. competitions. Have a look at the F.A. Youth Cup too. Have some leagues re-entered and has there been any other new entries? I now see what you meant as I was unaware of this. Highly unusual accepting entries after the draw was issued. I have amended the introduction and summary of the draw above. and Brighton become a 21st bye. in the North-East or North-West sections where there were "vacancies"
The FA should invest in a map. In fairness to them they are my "nearest" possible zonal labels based on the usual system they use. their acceptance of three late entries. This is making less and less sense. So now we're going to have 34 teams left in after the Preliminary Round? So the "new " First Round will have 18 teams in it. Interesting to see what they do then unless they realise their error before that stage. Manager Steve Lloyd has today announced the following squad for The FA Inter League Cup Extra Preliminary Round match between The Cheshire League and The Northern Football Alliance to be played on Saturday 13 April 2013, kick off 2pm, at Witton Albion FC. All players to meet at the Ground for 12-30pm In Trousers, Shirt & League Tie. In a very tight end to end game with few clear cut chances to either side, The Cheshire League defeated the Northern Football Alliance 1:0 with a goal from Ged McAllister in the 64th minute. Cheshire started their campaign after last season's exploits with a tough Prelim against a very good Northern Alliance side who were represented by Carlisle City. The early exchanges were limited to the midfield but Cheshire nearly went in front after 8 minutes when Chris Quirk's volley was saved by the visitors keeper. After this, chances were at a premium as the game was played out in the midfield with passes going astray and the strong wind and driving rain not helping both sides. The second half continued in the same vein, Paul Alcock fired a right foot shot that was comfortably saved again by the Alliance keeper. The game was being battled out in the middle third of the pitch and one goal was going to decide the game. On 64 minutes, it was the home side who got the crucial goal when a superb break from Chris Latham resulted in Ged McAllister side footing home from 8 yards. The Northern Alliance then threw everything they could at Cheshire but the home side stood firm to progress. Subs; Nathan Williams (Eagle). Not Used: Lee Morris (Whaley Bridge), Liam Myers (Knutsford), Dean Warburton (Knutsford), Chris Jones Tarporley Vics). Anyone know if there is currently an FA Inter-League Cup 'logo'? I've found one easily in the past but no luck this time round. After extra time, 4-4 at 90 minutes. Not sure of the scorers as I wasn't there but Kent scored first before the SAL equalised before HT. Kent went ahead again but the SAL then went 4-2 up. Kent scored two quickfire goals to force extra time being going 6-4 ahead, last being a penalty. The SAL got one back before the end. Bedfordshire scored with the last kick of the game. The Teesside League Representative side were knocked out of the F.A. Inter-League Cup after suffering a 4-2 defeat at North Ferriby United against the Humber Premier League. James Waltham gave the Humber League a 1-0 lead after twenty four minutes when he was left unmarked to head a pinpoint corner home. Danny Lockwood was denied what seemed a good penalty shout when brought down in the Humber League penalty box just before half time. A minute into the second half Mike O�Connell gave the Humber League a 2-0 lead which then seemed to spur the Teesside League into action. On the hour Paul Crager pulled it back to 2-1, ten minutes later Karl Lilly was brought down and was awarded a penalty, unfortunately his penalty kick hit the bar and was cleared. Not long after, Danny Lockwood had a well struck free kick brilliantly saved by Adam Nicholson in the Humber League goal. The killer goal came shortly afterwards when Danny Norton who looked well offside ran through to beat Andy McDonald in the Teesside League goal. just before the incident in the eighty-fourth minute, O�Connell�s free kick taking a big deflection to wrong foot McDonald in the Teesside League goal. Paul Turner was sent off for an elbow off the ball before Lilly pulled it back to 4-2. An entertaining though tight game turned on a controversial penalty decision, with the game poised at 2-2. Playing up the slope at Colney Heath, Brighton took the lead in an eventful minute for centre half Morgan Bull. to loop his header over the onrushing Herts keeper. This was after Herts began brightly, hitting the bar and testing Brighton keeper Aaron Merchant. deflected off of unlucky Steve Fernandez's head giving Merchant no chance in the Brighton goal. Just 15 seconds into the second half a ball was slipped in to Matt Jupp by Bobby Pannent, and Jupp powered the ball in to make it 2-1.
when a corner was whipped in from the left hand side and a header crashed onto the bar by the centre half but the rebound was poked in for 2-2. Then came the game changing decision. In the 70th minute just 2 minutes after the equalising goal, a penalty was awarded by referee Vicars for an alleged push by Logan Gunn which was scored. More controversy followed when Smith received a straight red card for foul and abusive language. With little time left and Brighton pressing for an equaliser, they were caught short at the back on the break Herts scored their 4th. Yes an ineligible player - probably Adam Hipperson, hat trick scorer, who was a late inclusion to the squad of only eleven players. After numerous ineligibility problems in the last competition you now submit your squad lists the week before the match for the F.A. to check them. 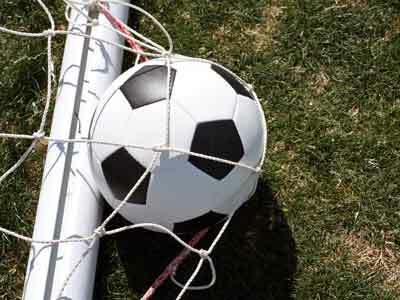 With several late withdrawals on Friday evening and even Saturday morning, it was a frantic preparation for the match. although some had to play out of their usual position, with Ryan Hemmings on the right wing instead of in goal. The home team had a lively start but overall the first half was fairly even, with both sides creating chances. Unfortunately, in the 26th minute, after some neat play, they scored and it stayed like that until half-time. A slight change in formation worked well and we started to control more of the play. and added another a few minutes later. The team were getting stronger as the game progressed and Neil Hurren added a third goal five minutes later. In injury time, Adam Hipperson added a fourth, to complete his hat-trick. Surrey Elite v Herts County is on 7th December at Corinthian-Casuals FC. I went to the Kent County game (deserved win by Dorset). Any reason why there are no attendances published? It looked like about 35 at Chatham, obviously the competition has not caught the public's imagination yet. Do leagues apply to play in this competition or do is it only for invitees to accept? If it is open to applications are there any leagues which have been turned down? which caused an extra round to have to be fitted in. Not the same treatment as their other competitions! being found guilty of playing two ineligible players in the last round. I don't think entry criteria has changed. It's step 7 leagues and non-NLS leagues who are invited as far as I know. The Southern Amateur League (my league) has been invited 4 times and accepted that entry on each occasion. 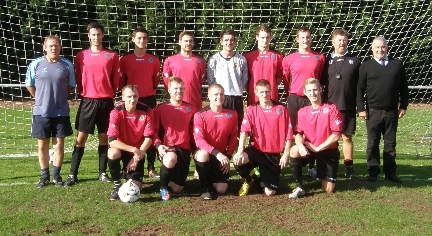 The invitation went via the county FA who also put forward the Amateur Football Combination.